specialists working in the field of endovascular treatment. This paper introduces important urologic measurements/tests, patient selection paradigms, clinical management concepts and expected results of prostate artery embolisation for interventional radiologists. Please note that all Case Reports are presenting individual patient data and therefore need to have the patient's consent to publish included. More rules on ethical compliance can be read in the Instructions for Authors. CVIR Endovascular reduced the prices for all authors who submit to the journal and get their papers accepted for publishing. As of now on, article processing charges will be only €1,060/£990/$1,390 (plus VAT or local taxes where applicable). Peer review is a good opportunity for early career researchers to play a role in the research community and gain valuable experience to help improve your own research writing. If you would like to get involved in peer review and are looking for tips on how to deliver a great review for CVIR Endovascular, we invite you to watch the new webinar produced by Prof. Jim Reekers, Editor-in-Chief. Would you like to report on a specialized topic of your interest addressing a specific question through a systematic assessment of research relevant to field of endovascular treatment and procedures? If you need funding for your open access fee, contact Prof. Jim Reekers with your proposal at info@cvirendovascular.org and ask for a waiver! CVIR Endovascular was created as a platform to publish papers focused on endovascular treatment and to keep the endovascular community updated through a continuous stream of publications. 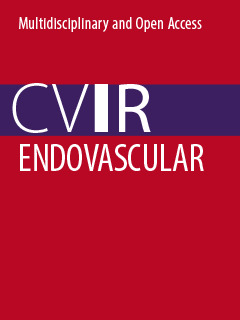 CVIR Endovascular is an online open access journal. It gives your research the opportunity to reach more audience! A published paper is freely available for everyone, immediately after publication.